Today ONLY, Prime Members can get this Etekcity Upgraded Air Mattress Blow Up Raised Guest Durable Firm Bed Inflatable Airbed with Built-in Electric Pump for $61.99 (Retail $89.99). -ALL-NIGHT COMFORT: Special inner construction make the air bed stable and comfortable like a real bed, capacity up to 550 pounds; unique wave veins support all parts of your body well, wipes out your all day fatigue , help you completely relax and enjoy a deep sleep all night. -QUICK &amp; CONVENIENT SETUP: Built-in electric pump quickly inflates or deflates airbed to desired firmness in about 3-5 minutes; power cable can be stored away in a built-in compartment to keep rooms clutter-free; Please ensure control dial is turned fully to inflate or deflate; suit for 18'' deep sheet. -QUALITY MATERIALS: Double layer construction with puncture-resistant material ensures the airbed will maintain its form; Waterproof flocked top are always dry and create amazingly comfortable sleeping experience, while the 0.4mm extra thick eco-friendly PVC underside prevents any unwanted sliding; Material is easy to clean after use, simply wipe down with a damp cloth. -EASY STORAGE &amp; TAKE OUT: Bed dimensions are 75 x 39 x 18 inches, indented sides allow regular pocket sheets up to 18 inches deep to stay on snugly; Package size are 14.5 x 13.5 x 7.5 inches, weight 13.15 lbs, easy to storage in your house or put in carry bag for travelling. 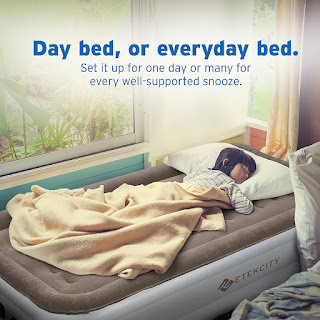 -HUMANIZED DESIGN: Superior welding make the air mattress completely air tight with no moving noise; unique edge design prevent from falling down, just enjoy a peace and quiet night with this blow up raised airbed; 1-year warranty and lifetime support provided by Etekcity.